ApexProTM CH telemetry offers a highly flexible and advanced telemetry system to meet the current and future telemetry needs of growing hospitals. ApexPro CH telemetry offers a highly flexible telemetry system to meet the current and future telemetry needs of growing hospitals. ApexPro CH relies on an exceptional networking infrastructure operating in the Wireless Medical Telemetry Service (WMTS) spectrum for dependable communication of vital patient information. ApexPro CH works seamlessly with CARESCAPETM Enterprise Access, GE's distributed antenna system solution, giving you the option to unite clinical intelligence across the enterprise under one halo of wireless coverage. This single infrastructure approach gives you expanded coverage area and the flexibility to deploy ApexPro CH telemetry wherever you need it. ApexPro CH telemetry can be used effectively for either centralized or decentralized monitoring. Because telemetry data is accessible enterprise-wide, patients can be placed flexibly throughout the organization while being monitored with ApexPro CH. Nurses are able to focus on patient care with the confidence that their patients are receiving continuous, quality monitoring. Whether you choose centralized or decentralized monitoring, ApexPro CH can help support your hospital protocol for continuous patient surveillance. ApexPro CH telemetry offers a WMTS-protected, wireless patient monitoring system that helps protect against signal interference and dropout. The system operates in both the 608 to 614 MHz and 1395 to 1400 MHz ranges, giving you flexibility and scalability to help reduce the possibility of transmission interference in virtually any RF environment. The CARESCAPE Telemetry T14 transmitter expands the capacity of the ApexPro CH telemetry system, enabling you to monitor up to 438 patients across the coverage area. This accommodates today's requirements and helps ensure capacity for future expansion. 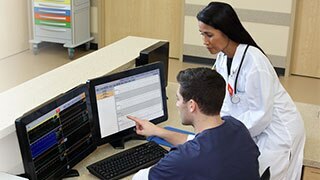 With ApexPro CH, vital patient details are available through a variety of information viewing devices to enable constant vigilance and workflow flexibility. When clinical intelligence can be accessed in so many convenient ways, caregivers are empowered to respond quickly to critical situations and take appropriate action. In Combination Mode, a CARESCAPE, DashTM, or SolarTM bedside monitor displays ApexPro CH telemetry waveforms alongside other vital signs, saving the time and inconvenience of disconnecting and reconnecting the patient to telemetry. In Rover Mode, a wireless CARESCAPE or Dash monitor and ApexPro CH telemetry together create a powerful mobile monitoring solution. ApexPro CH telemetry provides exceptional detection and analysis of patient data to help you fully and accurately monitor your patients’ status. 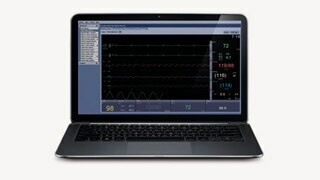 ApexPro CH uses the EK-Pro clinical algorithm, which processes and analyzes five independent, simultaneous ECG leads. Plus, an innovative Smart Leads Fail feature helps to reduce false ECG alarms. With EK-Pro, ApexPro CH supports advanced atrial fibrillation detection and alarming. 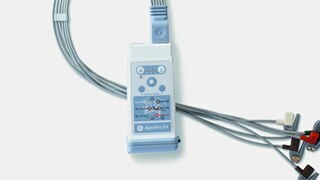 ApexPro CH has the capability to monitor two V-leads on each patient. Pace detection across two vectors improves the system’s ability to see and recognize a wide variety of pacemakers. The flexible design of ApexPro CH allows each transmitter to monitor only the parameters each patient requires. Continuous monitoring of ECG and SpO2 allow caregivers to tailor monitoring according to the patient’s acuity. EK-Pro five lead arrhythmia analysis provides advanced atrial fibrillation detection and alarming. Early and accurate identification of AFib may help prevent this arrhythmia from becoming chronic. Dual V-lead monitoring allows caregivers to be vigilant for both arrhythmias and ST segment changes through a better picture of the patient’s heart. Continuous SpO2 and episodic monitoring of NIBP and Temp allow caregivers to tailor monitoring according to the patient’s acuity. One source for data. Fast. Reliable. Compact.